The Great Blue Heron takes passengers for a 2 hour cruise into the Fathom Five National Marine Park in Ontario, Canada where they can view two shipwrecks in Big Tub Harbour. The Great Blue Heron, a glass bottom boat loaded with passengers, cruises into Big Tub Harbour in Fathom Five National Marine Park in Ontario, Canada where visitors can see 2 nineteenth century shipwrecks. The Great Blue Heron carries 125 people leaving from downtown Tobermory for a 2 hour boat tour which begins by visiting the shipwrecks. From Big Tub Harbour, the Great Blue Heron heads past Lighthouse Point to Russel Island, then into Cove Island where the beauty of White Rock, Cove Island Harbour, Otter Islands and Flowerpot Island can be seen. These boat tours run from the middle of May until the middle of October with at least 2 or 3 trips daily and many more scheduled during the peak of the summer season. The large glass bottom on the boat allows passengers to view the world beneath Lake Huron while enjoying a snack and the scenery around Fathom Five National Marine Park. 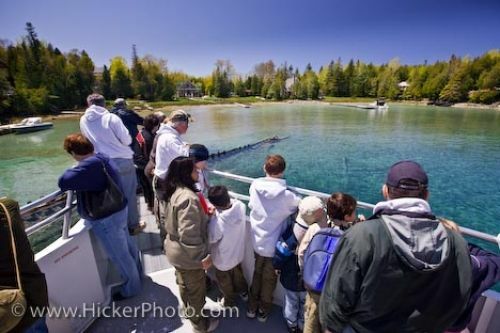 Picture of passengers aboard one of the boat tours on the Great Blue Heron into Fathom Five National Marine Park, Ontario. Passengers aboard the Great Blue Heron tour boat from Tobermory in the Fathom Five National Marine Park, Lake Huron, Ontario, Canada.